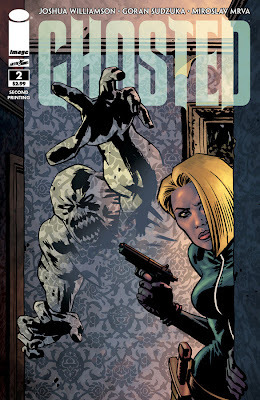 GHOSTED #2, the latest issue of the thrilling supernatural heist comic published by Image Comics imprint Skybound, has sold out at the distributor level after its first week of release and will be reprinted to meet demand alongside the release of GHOSTED #3 in September. Written by Joshua Williamson and drawn by Goran Sudzuka, GHOSTED stars Jackson Winters, a career thief who is released from prison for one reason: to steal a ghost from a haunted mansion for a very rich man. Winters gathers a team of psychics, magicians, ghost hunters, skeptics, and more to execute the heist, but even the most intricate of plans is far from foolproof. How do you prepare for the unknown? The second printing of GHOSTED #2 can be pre-ordered now (Diamond code JUL138232) and will be in stores on 9/11, the same day as GHOSTED #3.